Smarter Bendigo – an Alliance of fourteen local pillar organisations and global communications tech companies. Our shared objective is to facilitate smarter technology and investment, right here in Bendigo. Did you know 80% of Australia’s Gross Domestic Product (GDP) comes from its cities? It’s much the same story the world over, with regional and capital cities accounting for most of their nation’s economic output. That’s why the United Kingdom, the Netherlands, Spain, India and China have all introduced Smart City policy and projects, to better manage the economic and population growth of cities and to introduce smarter technology to facilitate the process. The Australian Government announced its Smart City policy framework in April 2016, sparking a national competition between cities to secure investment, talent and technology. Bendigo as at the cutting edge of this global effort to make cities smarter. Be.Bendigo is proud to have been the first home of Smarter Bendigo, an Alliance of fourteen local pillar organisations and global communications and technology companies to facilitate smarter technology and investment here in Bendigo. We have been on a strategy toward a Smarter Bendigo for ten months now, with strong leadership from the City of Greater Bendigo and tremendous support across the Alliance. Our Smarter Bendigo Strategy includes the delivery of a communications platform, to enable smarter travel, government services and business operations. Informed by established smart cities in Nanjing, China and Royal Oaks in the United Kingdom, a smart platform for Bendigo could mean up to 2GB per second download in the CBD. It may also facilitate the sharing of data on public asset management and public safety. Smart Cities are not just about leveraging smarter technology. They feature smart use of land, water, energy and public transport. They support smarter investment in people, health, in research and evaluation. Smarter Bendigo’s Strategy covers seven areas of priority and breaks our planned activity into three time horizons. The Alliance for a Smarter Bendigo presented our Strategy to The Hon. 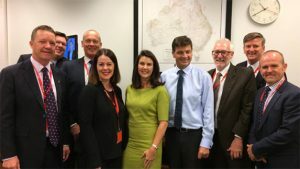 Angus Taylor, Minister for Cities and Digital Transformation in Canberra on 15 February. We are in ongoing talks with the Victorian Government, through the Department of Premier and Cabinet and Regional Development Victoria, facilitated by Greater Bendigo Mayor, Cr. Margaret O’Rourke. Greater Bendigo Council will become a signatory to the Global Smart Cities Alliance on 9th March. Bendigo will host the National Intelligent Communities Forum on Wednesday 15 March, at Bendigo Town Hall. The Victorian Department of Environment, Land, Water and Planning has partnered with Be.Bendigo and Telstra to run a three day Hackathon on April 10,11 and 12.